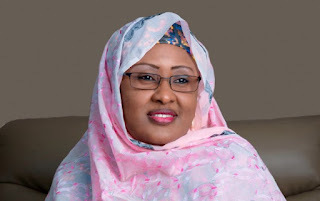 The Wife of the President, Mrs Aisha Buhari is seeking support for female entrepreneurs in Nigeria towards economic productivity and independence. Mrs Buhari, who said women should be given their pride of place in the development of the nation, warned, however that they should be mindful of the home front. She made the remark at the Women in Export Forum and Exhibition, organized by the Nigerian Export Promotion Council. Men and women involved in business gathered to discuss how women can be included in global export trade. At the event, Nigeria was integrated into the International Trade Centre a trade initiative, which aims to get one million women globally involved in international business by 2020. The initiative is geared towards tackling the challenges faced by women in export, including funding, capital and land acquisition, cultural beliefs, gender imbalance and lack of support from men. The target for Nigeria is to involve 100, 000 women in the initiative and most of the participants are hoping that the right support will come for the target to be attained. The Nigerian Export Promotion Council organized the event in collaboration with the International Trade Centre.